Our analysis springs from the observation – supported by considerable microeconomic evidence – that women and men bring different skills and perspectives to the workplace, including different attitudes to risk and collaboration (Lagarde 2014). Women have been found to be more risk averse, reflecting greater fear of negative outcomes (Croson and Gneezy 2009), and to be more averse to competition (Harbaugh et al. 2002). Gender differences have also been linked to the nature of the job (Brussevich et al. 2018), to the stakes, and to time pressure. Hiring women can increase the productivity of women already employed in a firm, by reducing within-firm discrimination. In addition, studies have shown that the gender composition of a firm’s board affects its performance. Deszö and Ross (2012) find that for firms whose strategy is based on innovation, gender inclusiveness has positive effects on firm value, and Christiansen and others (2016) find that the effect of female representativeness in corporate boards is larger for firms in the services sector, high-tech manufacturing, and knowledge-intensive services. Gender diversity in boards of banking-supervision agencies has also been associated with greater financial stability (Sahay and Čihák 2018). Surprisingly, previous studies have not looked at the macroeconomic implications of this microeconomic evidence. The evidence – from macroeconomic, sectoral, and firm-level data – shows that women and men complement each other in the production process (Ostry et al. 2018). To gauge the extent of complementarity, we estimate the elasticity of substitution (ES) between women and men in the production function. 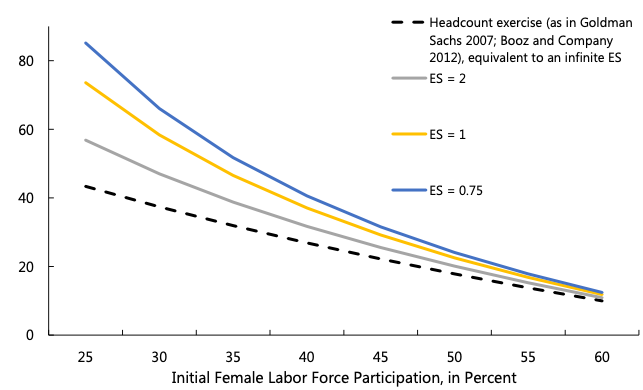 The ES measures the change in a firm’s use of female labour (relative to the use of male labour) when the marginal productivity of female labour (relative to the marginal productivity of male labour) increases. When the ES is zero, it is impossible to substitute male labour for female labour because producing a good requires fixed proportions of each gender. When the ES approaches infinity, male and female labour are indistinguishable and there are no gains from gender diversity. Intermediate values of the ES imply that the labour of men and women complement each other to produce the final output. 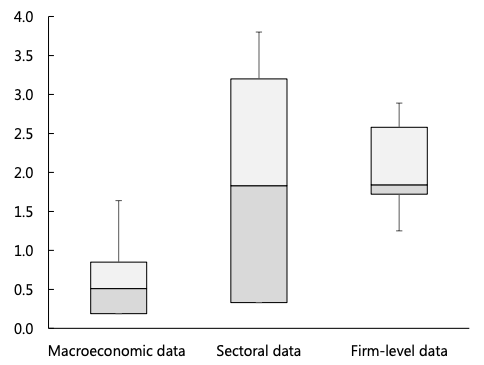 We find that the estimates are clustered below 1 in the macro data, between 1 and 2 in the sectoral data, and between 2 and 3 in the firm-level data (Figure 1). The assumption that there are no complementarities between female and male workers is decisively rejected by the data. When female workers are initially in short supply relative to men, the effect of increasing female employment is larger than the effect of an equivalent increase in male workers as long as female productivity is not substantially lower than male productivity. Models that do not account for complementarity therefore underestimate the impact of gender diversity on growth, inappropriately attributing a part of growth to total factor productivity rather than to its real cause – past increases in female participation. A key implication of our empirical analysis is that male wages are likely to rise as a result of narrowing gender participation gaps. There are two opposing effects from increasing female labour force participation (FLFP) on male wages. The first is the complementarity effect which increases productivity and thus male wages. The second is the capital-intensity effect which lowers wages as total labour supply increases. When the ES is below an estimated threshold of about 2.5 (as it is in our estimates), the first effect dominates and higher FLFP tends to boost men’s real wages. This is important because it should strengthen support for removing barriers that hold women back from productive participation in the labour force. Note: The calculations assume that there are constant returns to scale to labour, that male labour force participation is at 75 percent, and that women’s working hours are 17% lower than men’s. See Ostry et al. (2018) for explanations of the calculations. The finding of gender complementarity – that gender diversity yields additional benefits – can also be incorporated into a model used to assess the welfare costs from different barriers to FLFP. The model disaggregates between the production of home goods and marketable goods to differentiate gains in GDP from gains in welfare. It also allows the number of women employed in different sectors to be driven by both the presence of barriers – capturing discrimination, cultural differences, social norms, and so on, which can affect either labour demand and/or supply – and the presence of potential differences in productivity across sectors. 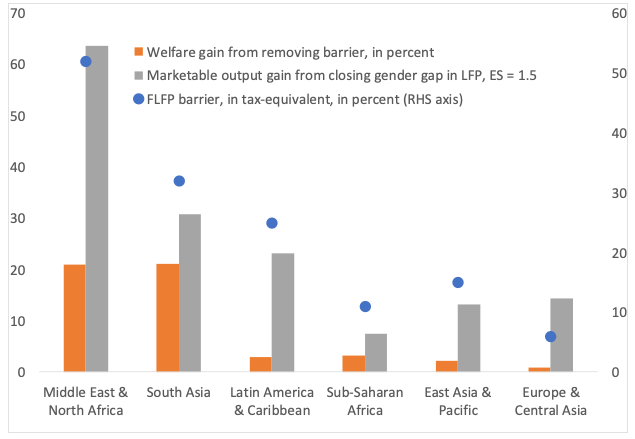 With services typically being a relatively more gender-equal sector, the model can be used to quantify the costs of barriers to FLFP when such barriers interfere with the process of structural transformation that is inherent in economic development. Brussevich, M, E Dabla-Norris, C Kamunge, P Karnane, S Khalid, and K Kochhar (2018), “Gender, Technology, and the Future of Work”, IMF Staff Discussion Note 18/07. Christiansen, L, H Lin, J Pereira, P Topalova, and R Turk (2016), “Gender Diversity in Senior Positions and Firm Performance: Evidence from Europe”, IMF Working Paper 16/50. Dezsö, C L, and D G Ross (2012), “Does Female Representation in Top Management Improve Firm Performance? A Panel Data Investigation”, Strategic Management Journal 33(9): 1072–1089. Lagarde, C (2014), “Daring the Difference: The 3 L’s of Women’s Empowerment,” remarks by IMF Managing Director made at the National Democratic Institute, Washington, DC, 19 May. Harbaugh, W, K Krause, and S Liday (2002), “Bargaining by Children”, University of Oregon Economics Department Working Paper 2002-4. Ostry, J D, A Berg, and C G Tsangarides (2014), “Redistribution, Inequality, and Growth”, IMF Staff Discussion Note 14/02. Ostry, J D, J Alvarez, R Espinoza, and C Papageorgiou (2018), “Economic Gains from Gender Inclusion: New Mechanisms, New Evidence.” IMF Staff Discussion Note 18/06. Sahay, R, and M Čihák (2018), “Women in Finance: A Case for Closing Gaps”, IMF Staff Discussion Note 18/05.